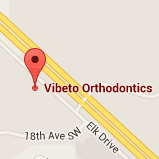 Great Smiles Come from Vibeto Orthodontics! At the Minot, ND orthodontic practice of Dr. Bryan Vibeto, you can achieve the smile of your dreams! We take the time to work with you individually, creating a treatment plan that will meet your specific needs and expectations. Our team provides a relaxed, stress-free environment where you are sure to feel welcome and comfortable. If you have any questions about any of the treatments we provide, or would like to schedule a complimentary initial orthodontic consultation, please contact our office!